I love sweet tea, the sweeter the better. It is not a food per se, but it is the best compliment to a meal. The yummiest sweet tea is the brewed kind you get in a restaurant. This is more prevalent in the South, but having sweet tea as a beverage option is becoming more common everywhere. The buffet at Maryland Live Casino has really good, really sweet, sweet tea. Some restaurants offer you nestea which is sweetened but it’s not the same – it is sort of carbonated and doesn’t really take like tea at all. Most restaurants offered brewed tea that is not sweetened. You can add a sweetener to it, but it’s not the same. For real sweet tea, you must add the sugar while it’s brewing or even better yet add a liquid sugar syrup to the hot tea. Fast food restaurants tend to offer sweet tea. The best is Chick-fil-A’s sweet tea, almost authentic. McDonald’s offers a large sweet tea for $1. It’s not that great, but it gets the job done – lots of sugar and caffeine. 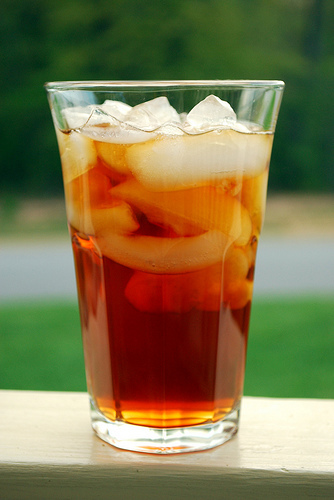 Sweet tea is easy to make at home. Just make tea as you normally would (with family size tea bags) and add the sugar while it is brewing. And never, ever add a lemon. Ok, some people like lemon with their sweet tea, but I think it takes away from the sweetness.